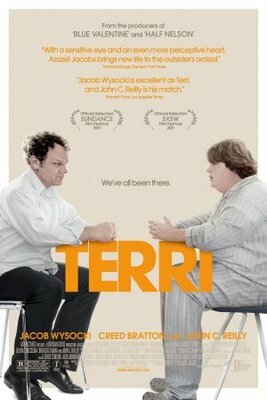 TERRI is a movie that is so unique, goes so much at its own pace and with its own concerns, that it's hard to characterise and hard to know what to make of it. What I can say is that it is beautifully observed, well-acted, causes moments of genuine un-ease but also genuine human warmth.....It is perhaps the most idiosyncratic movie of the festival and none the worse for that. Essentially, this is a movie about a group of misfits - the odd kids, the marginalised adults - that make up society but rarely make it onto the big screen. Chief among them is Terri (a fearless performance by Jacob Wysocki), an obese kid who lives with his ailing uncle in a ramshackle house, wears pyjamas to school, gets teased as a result, and yet has a Good Heart. He forms unlikely friendships with another troubled kid, Chad (Bridger Zadina) and is mentored by the bizarrely intense assistant principal, Mr Fitzgerald (John C Reilly). Perhaps most bizarrely of all, he ends up on a weird night of drinking and intimacy with the school's hottest girl (another fearless performance from Olivia Crocicchia) after he unintentionally precipitates her near-expulsion. What I love about this film is its refusal to sentimalise or smooth over the strange weirdness of these people and their relationships, but also it's evident fondness for them. The subject matter is honest, brutally so, but as Roger Ebert has pointed out, this film in no way deserves its US "R" rating. One can only hope the BBFC is more mature, if and when this film gets a UK release. That's not to say that there weren't passages in the first half hour when I was wondering where the film was going. But if you stick with it, this really is a wonderful film, full of humanity, insight and beauty, as encapsulated in a truly memorable speech by Mr Fitzgerald on frailty and trying to do the best we can. TERRI played Sundance 2011. It opened in the US in July and in Canada in August.